The Syrian regime is has been imposing a suffocating siege on Al-Wa’r neighborhood in western Homs, where approximately 15,000 families lives, since Thursday 10 October, 2013. The siege is overwhelmingly limiting the movements of residents from and to the neighborhood where it bans anyone who doesn’t has an employee card, student card, or medical student from entering or leaving the neighborhood. Furthermore, the Syrian regime checkpoints prevents the entrance of any food, medications, and fuel into the neighborhood except on rare occasions under pressure. 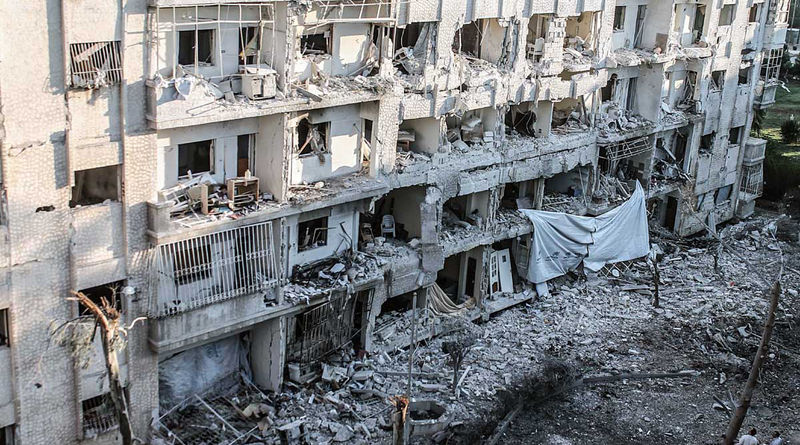 The Syrian regime escalated its campaign on 4 October, 2014 as a response to the bombing of an elementary school in Akrima neighborhood which has a majority of residents that support the Syrian regime. In no more than 12 days (Saturday 4 October – Wednesday 15 October), the Syrian regime carried out dozens of indiscriminate strikes against the neighborhood which deepened the suffering of the neighborhood residents that are living under the siege. We recorded, in this period of time, the use of 10 surface-to-surface missiles, 30 explosive cylinders, and tens of mortar shells against the neighborhood at least. On Wednesday 8 October, 2014, a residential tower was targeted using two explosive cylinders which killed seven victims including four children and two women according to SNHR documentation. On Wednesday 15 October, 2014, the neighborhood was targeted with a surface-to-surface missile and more than 10 explosive cylinders which killed a total of nine people including three children on one day. Also, we documented the targeting of many vital centers in the neighborhood. On Tuesday 14 October the Syrian regime shelled the power station with a mortal shell. SNHR documented, in 12-day period of time, the killing of 24 civilians including seven children and six ladies.